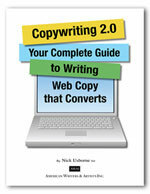 You have found the “Missing Link” of internet success – persuasive website copywriting. And we are not talking about linking programs or the legal concept of “copyrighting” content- we are talking the basic element of internet selling, which is often overlooked in the design oriented online industry. That basic element is persuasive web site copywriting – the term used for writing online sales copy – the powerful words that sell your products or services. The Secret is almost out! What secret? Well, it is not much of a secret in the brick and mortar world. But, it is a secret in the online Website World. We believe that “website copywriting” will be the next huge buzzword on how to be successful online. Like “viral marketing”, “B2B”, “branding”, etc…. 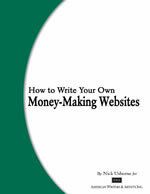 Only about 2% of websites are making money. How do they do it? By using selling wordsâ€¦ persuasive words. In a nutshell: powerful website copywriting. If you follow the guidelines in these powerful copywriting products, you will be in that 2%, and not the other 98% who have don’t understand the importance of persuasive sales copy. Words are your site’s salespeople. Working 24/7 for free. Once you have “trained” them by using powerful website copywriting techniques, your site will become your #1 salesperson – working hard for you while you enjoy some of your hard earned success. Do you just hand out pictures of your products during a sales call? Hand out pictures of you performing a service? Of course not! You use your persuasive words to sell your customer on the benefits of working with your business. You, as the owner, know the words to use to turn a prospect into a customer. But, does your internet site? You know your products and/or services. You know your clients and customers. You say you are not a writer. That might be true – but you are a persuader. With a small investment, these internet copywriting courses and classes will show you how, in an easy step-by-step process, to become a master e-persuader for your online business. PS: All of these products have a 100% Money Back Guarantee. We would never sell a product that did not have a great guarantee.